Birthdays are important occasions in Russia and are celebrated от всей души (wholeheartedly). The traditional greeting is С днём рождения! (Happy Birthday) although the и sound is rarely annunciated. So it sounds more like С днём рожденья or, for particularly fast-talking Russians, even с днём рожденя. Sometimes you might also hear с днём варенья (literally: happy jam day), which is used mostly to congratulate children or really good friends. 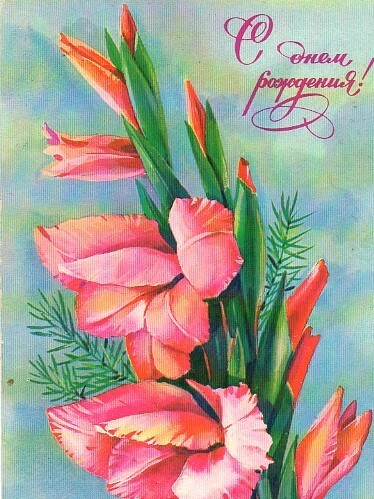 Желаю всего самого лучшего (I am wishing you all the best) is the basic one. You can start here and then elaborate. Желаю здоровья, счастья и любви (I am wishing you health, happiness and love) is another commonly used greeting. Желаю, чтобы у тебя всё было, а тебе за это ничего бы не было (I wish you have it all without repercussions) is ok if you are good friends with the именинница (birthday girl, woman) or именинник (birthday boy, man). Желаю, чтобы все Ваши мечты сбылись (I wish that all your dreams come true) or Желаю всего, чего Вы сами себе желаете (I wish you all that you wish for yourself) always work. You can replace the formal Ваши (your) with an informal твои (your) for a close friend or a child. Oh, and instead of the _______ use either the name of the birthday person, the word именинница or именинник, or a phrase виновница торжества (hero of the day, for a woman) or виновник торжества (hero of the day, for a man). Удачи (Good luck) and enjoy the party! This is a great job. Your twitter is great too. So helpfull to keep my Russian at least basic. Thanks. Great! Very informative. Liked it alot! Wow, that’s seriously useful – and must have taken a lot of work to put together. Well done and thank you! very helpful, I find phrases a useful way to absorb the language. But even more helpful would be the sound as well! Is that asking too much? Sorry! Yelena, this was a great blog entry! I love learning phrases and ways to ‘fit in’. I would really appreciate if you would explain how to give condolences or express sympathy for someone who has experienced a loss or a death in the family, from a friend to a friend. Thank your for your willingness to teach us! ….and (now I start thinking about it) the language you need as a learner: what do you call X? please speak slower, please repeat…, poka! Hi Barbara, yes, of course! It’s an old Soviet postcard. You can find a lot more at this link – https://www.google.com/search?q=советские+открытки+с+днем+рождения (just switch to Images view).